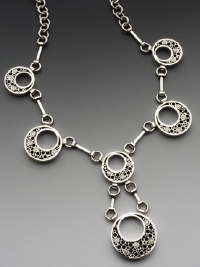 mocashop.com – Half Moon Necklace. Sterling silver chain handmade in house, in a combination of loops and bars, original from this artist, with her signature work in half moon shaped oval pendants in oxidized and shiny sterling silver with your choice of moissanites (shown), garnets or aquamarines. Toggle clasp. This artist requires 3 weeks to ship from her studio. Lengths: 16″ or 18″.